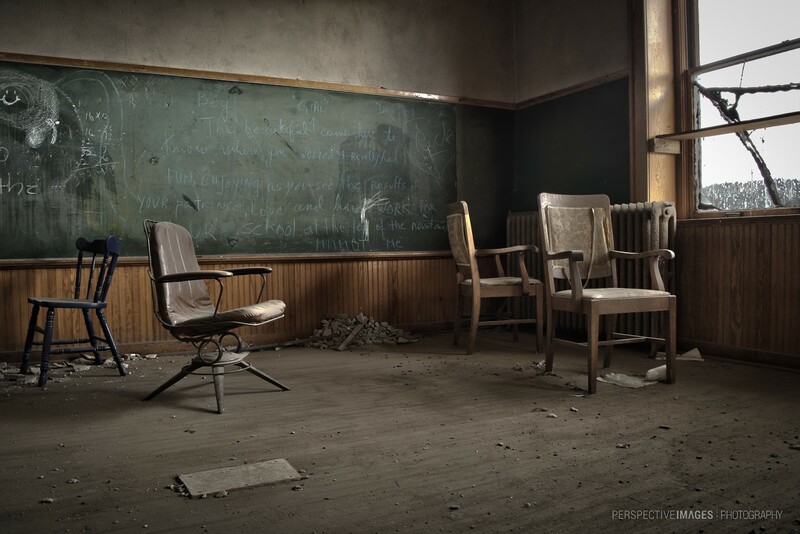 Teachers chairs sit collecting dust and the remnants of the last lessons taught cover the chalk boards at a long abandoned school house. As a parent, these types locations are very poignant to myself, I can imagine the corridors and classrooms filled with children, knowing that this place likely held some of the best memories of their childhood. It very much is, I’m glad the vandals and taggers haven’t found their way in. The blackboard message reads like a final message from the teacher to the students before school lets out for the summer, for the last time. And amazingly it has stayed there for 30 years! it’s like everyone decided to up and leave this place alone all at the same time, very nice! Yup, apart from some building materials and hardware being dumped there, the place is largely untouched. Fascinating composition Will. Like the mood that you captured here. Indeed there are a lot of emotions going on at that age. Ces vieilles classes abandonnées ont toujours un effet extraordinaire, superbe boulot !